Have you heard of the wonderful “OnStar” system from General Motors? The Ranger is like an OnStar for a human! The smallest, lightest, and most compact mobile medical alert on the market, and our most popular product. 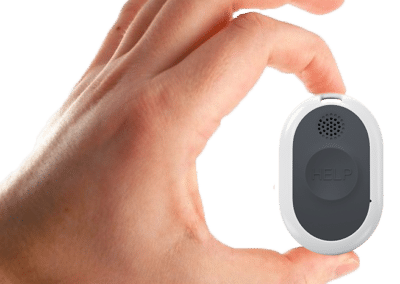 Wear it on a keychain, on the belt, in a pocket, around the neck—provides mobile medical alert protection with GPS on the most up-to-date 4G network, so our skilled staff can find you and send help anywhere. Works on the great AT&T network—it means you’re never alone, anywhere. Press the button, and talk to our wonderful team, at any time, for any reason! BlueStar CEO, Admiral Rob Wray, gives an overview of the Ranger mobile medical alert system. The Ranger is a highly-reliable, compact and durable medical alert system with real-time GPS tracking, an SOS button and two-way voice communication. It is the smallest mobile medical alert system available on the market today – and it’s even shower-safe. 24/7 U.S. Based Nationwide Emergency Monitoring: Members of our response team are highly skilled in quickly assessing the situation and contacting the designated family member, friend, and/or emergency services. Nationwide coverage: Operates on the ATT 4G LTE network. Lifetime Price Guarantee: Your low price is guaranteed for as long as you are a customer. Once all equipment that came with your order is returned (including power supplies, neck pendants, wristbands, charging cradles, and safety sensors), you will receive a prorated refund plus a refund for any unused months of service. If you return within the first 30 days, you will receive a full refund after the equipment that came with your order has been received. A lost or damaged equipment fee of up to $350 will be charged for the Ranger 4G. If you have any questions regarding your equipment, return policy, or where to return the device, please contact our Customer Care Department at 1-800-300-1724, option 2. I wear the BlueStar device the time. I press SOS if I want the ambulance or the police to come, and somebody will come immediately. The BlueStar team will also talk to you and you could talk to them back. They call back immediately. By accident, I bend over and it pressed the device against the table that was beside me. The device came on right immediately. The team asked me if I was okay. I said it was an accident and apologized. They were right here, too. They said if the device went off, they come to see what was wrong with me, if I need an ambulance or the police. Overall, BlueStar has been right on the job. Somebody called me about BlueStar HonorCare and I listened to what they had to say but I didn’t act upon it at that time. But right after that, I fell in the backyard, rolled down to the steps, hit my head on the steps and knocked myself out. It started raining and I woke up. That’s when I went ahead and decided to pull that number up. They said I can go anywhere and I don’t have to be at the house so I ordered the Ranger service button. An adult person should have some type of alert system. I’m 82 years old and I’m in an adult facility now. Before I signed up for BlueStar, I was driving and shopping on my own without any supervision. My husband was 20 years’ air force and I support the US and I’ve been a member of the VFW for 30 years. BlueStar is veteran-owned and I support the veterans so I got the alert. I’ve had BlueStar less than a year and I love it. It's less expensive. I'm 80 years old and I live alone, so I wanted it in case of an emergency. Other devices have two pieces: one that you carry around and the speaker. When I'm in the backyard and the speaker is in my home, the thing I carry with me won't do any good. I wanted to have it all together, so I went with BlueStar HonorCare. I've pushed the button by accident many times and they're very fast and nice people. One day, the button was pushed and I didn't even know so I didn't answer. My phone was off and they reached out to my brother, but he was quite a ways from me, so they just called the paramedics. However, before my brother called me, the paramedic was already here. I've been gone through so many different types but this is the fastest so far. I'm very satisfied with it. I was falling down and once in a while, I would pass out. BlueStar HonorCare was a little cheaper than others. I got the one that is worn around the neck and it works just fine. On Thanksgiving Day, my grandkids hugged me and the alarm came off. I heard it go off, so I immediately told them what happened. They responded right away. It was only a couple of seconds before they were on the air talking to me. I love my device and recommend it. I'm on oxygen 24/7 and I have an artificial knee. I fell in my tub before so I thought that it was time to get a life alert. BlueStar HonorCare helps veterans and my father was in the service so I ordered the Ranger product from them. BlueStar's team has been very nice and respectful and they answered any question I had. When my son had a high-grade fever for two days and I couldn't break it, I pushed the button to get him help and the BlueStar team responded really fast. In the hospital, the doctor said that my son is lucky to be alive. He had such a severe infection in his body to have a heart surgery. If it wasn’t for the little button, he wouldn't be here today. BlueStar's product is very good and a lot of people could benefit from it. My son and I did.